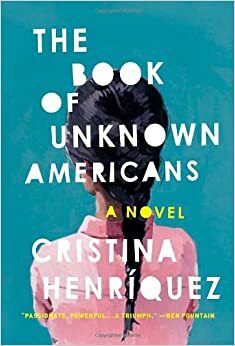 This is a passionate novel about what it means to become “American,” from a new immigrant perspective. Meet the Riveras, Arturo, Alma and Maribel. The opening scene of the novel has the Riveras confused after being dropped off at a Newark, Delaware, convenience store fresh from 3 day cross-border journey from their small town in Mexico. Thinking that the convenience store/gas station is where Americans shop, the Riveras are baffled by the microwave hot dogs, slushy drinks and high prices of food in plastic. Into this confusing landscape Arturo and Alma have brought their 15-year old daughter Maribel from Mexico; she suffers from a traumatic brain injury that dramatically altered her personality and ability to reason, but with the right education, she has a chance at regaining function. In search of a better life for his daughter, Arturo forgoes his own construction company in Mexico, and gets a job toiling in the dark in a mushroom factory in the hopes that the US education system they have dreamed about can help Maribel. The entire novel is focused on and set in a concrete block, low-income apartment building whose residents are new immigrants from all over Central and South America. The residents’ stories are told in alternating chapters. Equally compelling is the story of the Toros, a Panamanian family whose son Mayor falls for the gorgeous Maribel. Rather than seeing Maribel as damaged and needing fixing as the rest of the world (and her parents) see her, Mayor accepts her for what she is, although their ill-fated puppy love will have disastrous consequences for all. Recommended novel, a great book club discussion choice. I’m a pretty hard-nosed, jaded reader, and this book touched me.